EDIT / NOTE : Most of the above claims were challenged. While some claims (especially the one about efficiency) survived more or less intact, others survive only with substantial modification or remain highly disputed. It’s difficult to get one’s head around the evolution of the debate on all the issues, because there are so many claims in TOC, so many criticisms and defences, and so many nuanced modifications. 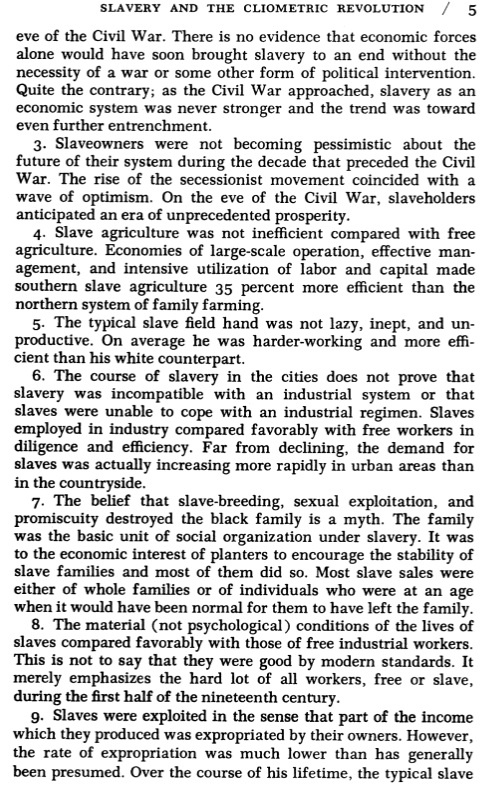 Suffice it to say, some claims (like the viability and health of the slave economic system in 1860 or the economic dynamism and vitality of the antebellum South in general) had already been widely accepted at the time TOC came out. I think the claim that survived the least modified was the one about the relative productive efficiency of slave and free economies, but I think there’s still disagreement about the reasons for the efficiency gap. Other claims — the “whipping index”, the positive incentives, the material condition of slaves, their imputed income — were much much more controversial and did not fare well under scrutiny. This entry was posted in Uncategorized and tagged Time on the Cross. Bookmark the permalink.